Many County departments, public agencies, private-sector prime and subcontractors use the CBE listing to meet subcontracting goals. To view a list of agencies that certify DBE’s under the Unified Certification Program, click the button. Your business will be included in the County’s CBE listing. Many County departments, public agencies, private-sector prime and subcontractors use the CBE listing to meet subcontracting goals. How are DBEs eligible for certification and participation? How are DVBEs eligible for participation? DVBEs who are certified with Los Angeles County will automatically qualify for inclusion in the CBE program. You do not have to apply for two separate programs. How do I apply for certification/participation? How do I apply for CBE certification? To apply for CBE certification with Los Angeles County, your business must apply through the LA County WebVen portal below. 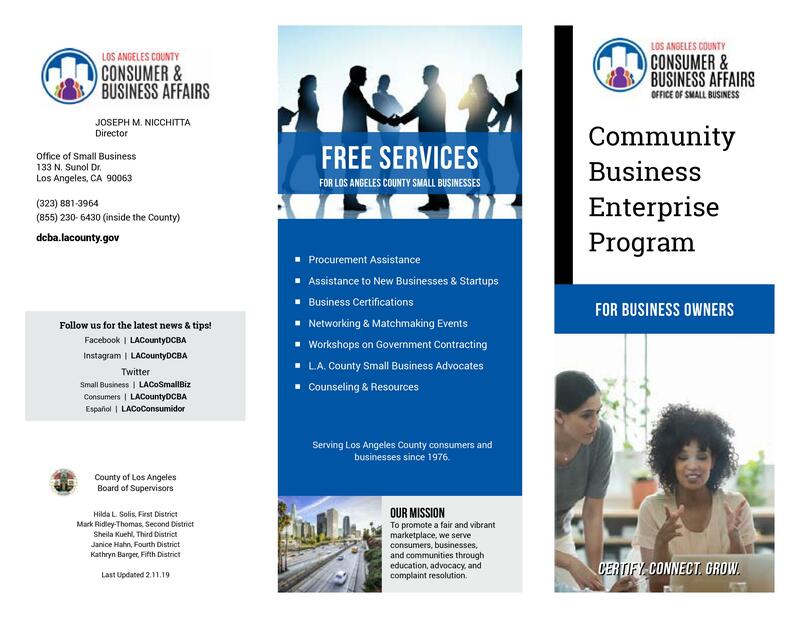 The Community Business Enterprise (CBE) Program encourages business owners who are minorities, women, disabled veterans, or disadvantaged to capitalize on opportunities in government and private-sector procurement programs. WHO IS ELIGIBLE FOR CBE CERTIFICATION? How are MBEs eligible for certification with Los Angeles County? How are WBEs eligible for certification with Los Angeles County?